Why the rebels rejected the AU ceasefire. Benghazi, Libya—Earlier this week, a delegation from the African Union (AU), composed of 53 African states, shuttled between the Libyan capital of Tripoli and the rebel stronghold of Benghazi, seeking to end the fighting that has been peppered with airstrikes by the NATO against Muammar Qaddafi’s forces. Qaddafi accepted an AU-backed ceasefire plan, but the initiative to halt the seven-week-long violence in Libya faltered Monday, when leaders of the opposition rejected it. The TNC felt itself pigeonholed by popular sentiment: It is under intense pressure from Libyans in rebel-controlled territory to reject any deal that does not include Qaddafi’s departure. Outside the Tibesti Hotel in Benghazi, where TNC members huddled with the AU presidents, hundreds of people shouted, “No, no, we don’t want Muammar and his children!” Each day, Benghazi residents chant similar refrains outside the local courthouse where they gather in the evenings to wave Libyan flags and study pictures of those still missing from the early days of fighting in February. But the TNC’s dismissal of the deal makes sense for an additional reason: Qaddafi’s relationship with the AU. Qaddafi has cultivated ties with African nations since he spurned the Arab world for its refusal to vociferously condemn United Nations (U.N.) sanctions imposed against Libya for its involvement in downing a 1988 American airliner over the United Kingdom. The AU was born out of Qaddafi’s speech during a 1999 African summit where he pledged to create a “United States of Africa” modeled on the European Union (EU). He followed up by providing $1 million in seed money to incubate the proposed federation. Later, in March 2001, Qaddafi declared that he planned to “throw in his lot with Africa” and backed up his words by lavishing his country’s oil wealth on the continent’s impoverished nations. He built close ties with Zimbabwe and Robert Mugabe, whom he bailed out of a financial crisis with $100 million about a decade ago, and, in 2001, he hand-delivered 1,000 tons of aid to drought plagued Kenya. Today, Qaddafi’s African largesse has paid off. 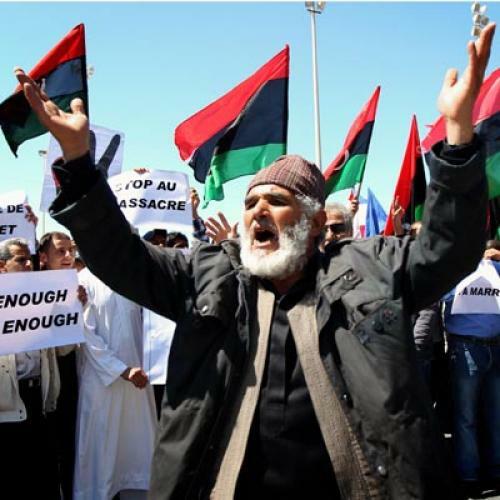 While the U.N. and EU have imposed sanctions on Libya, and the Arab League has suspended its membership and supported a no-fly zone, the AU has refused to follow suit. On March 10, the AU’s Peace and Security Council issued a statement rejecting “any foreign military intervention” in Libya as a slap in the face of NATO airstrikes. So it makes sense the dictator was eager to meet the AU leaders, while the TNC was cool toward the initiative. Qaddafi hoped to demonstrate to both Libyans and the international community that, although Western nations have dubbed him a pariah who must step down immediately, African nations still consider him a chief of state. But the TNC rightly understood that, considering its track record with Libya’s leader, AU recognition of Qaddafi counts for very little. Her sentiments have resonated in Benghazi, where residents continue their daily protests. “He spilled too much blood during his forty-one years in power. He needs to leave now,” 47-year-old gold merchant Ali Sasi said of Qaddafi. The AU initiative, it seems, has proven to be nothing more than an exercise in futile diplomacy.